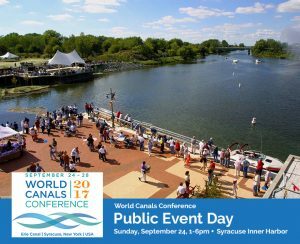 Join Canal NY during the Public Event Days at the World Canals Conference at the Inner Harbor of Syracuse on Sunday Sept. 24th from 1pm. – 6pm. Through the generosity of Erie Canalway Canal NY will be attending the event with our Discover the Erie Canal display. As always we will be promoting the Erie Canal and the membership of Canal NY throughout the conference. All events at the Syracuse Inner Harbor except where noted. Tour replica 1862 canal schooner Lois McClure. Row a traditional six-oar long boat built at the Lake Champlain Maritime Museum. Watch live hot glass shows presented by the Corning Museum of Glass GlassBarge. Try paddling! Free kayak lessons & demonstrations. Tour Onondaga Lake by boat from the Honeywell Visitor Center. Cycle to the Inner Harbor with Tour the Towpath as it completes its two-day tour from Rome to Syracuse. Meet at the Old Erie Canal State Park trailhead in DeWitt (5100 Butternut Drive) at 1pm for a guided ride through Syracuse. Visit the Erie Canal Museum along the way. Sample Taste NY specialty foods and food trucks, including The Chicken Bandit, Toss ‘n’ Fire Wood-Fired Pizza, PB&J Lunchbox, and Frost Bite Show Cream Shavery. Visit the Freight House for exhibits and displays. Reel in a carp with the Wild Carp Club and observe live fish from Onondaga Lake displayed by students from the State University of New York School of Environmental Science and Forestry. “Doors Open” at Museums & Galleries, Downtown Syracuse, 1-5 pm, Experience dynamic cultural institutions, including the Erie Canal Museum, Everson Museum of Art, and Onondaga Historical Association. Water Way Youth Video Exhibition, Everson Museum of Art, Outdoor Exhibition Venue, 7:20 pm- Enjoy the premier screening of 1-3 minute short films focusing on canal life and culture through the eyes, experience and imagination of young people from Scotland, Belgium, Italy and New York State. Projections will be shown each night from September 24-28. Canal Crossings Street Murals- Head to E. Water Street by the Erie Canal Museum for the opening Block Party of a contemporary public art project that celebrates the historic Erie Canal and brings tribute to the lasting effect the canal has had in Central New York. Free shuttles will be available to conference attendees, with stops at the Marriott Syracuse Downtown, along the Creek Walk, the Honeywell Visitor’s Center on the lake, and Syracuse Inner Harbor.